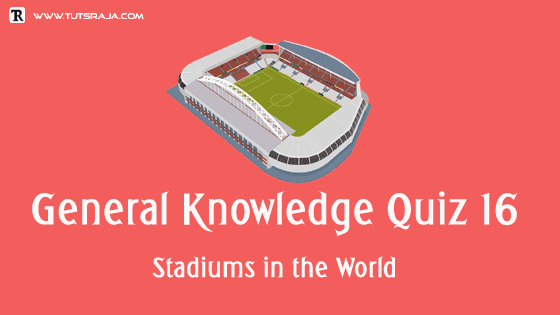 Today general knowledge quiz is about stadiums in the world. It is static GK topic. Chances are less to get this type of questions but prepare well. Prepare only important stadiums for exams. Please remember all Indian stadiums and other recent news stadiums. If you learn this topic, you might get one mark in an exam. They may ask question indirectly. 1. Where is Wankhede Stadium ? Wankhede Stadium is located in Mumbai (Cricket). 2. Where is the Eden Gardens ? The Eden Gardens is located in Kolkata (Cricket). 3. Where is the Galle International Stadium ? The Galle International Stadium is located in Sri Lanka. 4. Where is the Guyana Cricket Stadium ? The Guyana Cricket Stadium is located in West Indies. 5. Where is the Chittagong Stadium ? The Chittagong Stadium is located in Bangladesh. 6. The Gaddafi Stadium is for which sport ? The Gaddafi Stadium is for cricket. 7. Which of the following is not correctly matched ? The Bundaberg Rum Stadium is for multipurpose (Australia). 8. Which of the following stadium is not for cricket ? 9. Lal Bahadur Shastri Stadium is for which sport ? 10. Where is the Feroz Shah Kotla stadium ? The Feroz Shah Kotla stadium is located in Delhi.